Insect bites are a constant source of irritation to humans. 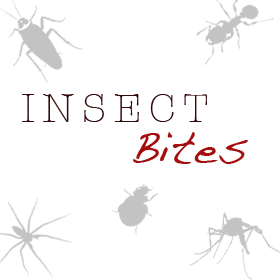 Since insects comprise the majority of all living organisms, it is practically impossible to completely avoid their bites. An insect will generally bite for one of two main reasons: to feed, or to defend itself. No matter what reason the insect has for taking a bite, their bites can cause skin problems to humans and animals. In some cases, insect bites can carry diseases which can be very harmful or even fatal. Insect bites vary greatly depending on what specific insect caused the bite. In a lot of cases, insect bites are undetectable or do not cause any problem. For larger insects with large chelicerae or mouths, skin tears, pain and bleeding might be present. For insects with stingers and venom, their bite might be more obvious because of the signs and symptoms which follow after a bite. It shoudl be noted that a spider bite is not generally categorized as an insect bite. The signs and symptoms of some bites are a result of the venom that some insects have. Once injected into the skin of the bitten human or animal, the venom will cause signs and symptoms ranging from local skin reaction to allergic reaction. In some cases, insect bites can cause the transmission of diseases. Local infection generally from scratching the bitten area. Inflammation reaction if the bite visibly broke the skin. Although the best cause of action is preventing bites in the first place, in which case insect traps and control can be effective, bites can still happen. Knowing how to deal with the bite is important to prevent further aggravation of the signs and symptoms. Insects with biting mouth parts can cause very visible skin tears. 1. The first thing to do is to clean the area with mild soap and water. 2. Observe the bitten area for what type of reaction it will cause. Local and mild reaction (see table above) can be treated at home. Keeping the bitten area clean until fully healed, and observation of signs and symptoms are usually all that is needed. Insects with venom typically cause an immediate reaction which is very visible. The bitten area generally has a puncture wound, or two puncture wounds, through which the venom was injected. 1. Clean the area with mild soap and water. 2. Observe the bitten area for effects of the venom. Insects with venom causes mild to severe reaction (see table above). Mild reactions can be treated at home but any sign of severe reaction should receive immediate medical attention. Bees and wasps are two common insects which have stingers. With these insects, the stinger is typically left attached to the skin of the stung individual. The following measures should be taken: 1. Take the stinger off by scraping it away from the skin with the use of a credit card, or paper. Avoid squishing the stinger to avoid injecting more venom unto the skin. Do not use tweezers. 2. Observe the stung area. Stings can cause mild to severe reactions (see table above). Mild reactions can benefit from home treatment but anything more than a local and mild reaction should be brought to the attention of a medical professional. Treatment for severe reaction to insect bites should always be prompt medical attention. Do not attempt to treat a severe reaction without a doctor’s supervision. Severe reaction to insect bites may be life threatening and should be taken seriously. Dealing with insect bites is something that everyone should have some knowledge of, since insects are some of the most common organisms on the planet. Any insect bite should be observed for the type of reaction it causes, and the proper treatment be given to prevent complications resulting from insect bites.